Yesterday, I walked down to Lincoln Center to take care of some errands. Number one on the list was purchasing tickets to take Cody to the New Year's Day performance of The Magic Flute at the Met. His first opera! I can't wait to share it with him. The Met box office was considerably slower than it was last Sunday, but the alternate route down through Avery Fisher, into the concourse and then up the orchestra level staircase is the only way in to the house. That joyful task accomplished, I moved on to the Performing Arts Library to change my designated pick-up library. You see, the NYPL has a great online search system. You find what you want, then they deliver it to the library of your choice. I always used the Donnell in midtown because of it's convenience to my office. But the Donnell has been temporarily closed until a New Orient-Express Hotel is built in that spot. Just what midtown needs - another luxury hotel. Anyway, while there I took time to browse the stacks. It's like being a kid in a candy store - so many musicals, concerts and operas on dvd and vhs. From the Masters series, I chose Richard Rodgers: The Sweetest Sounds, Legends of Broadway: Leonard Bernstein, Richard Rodgers and The Women of Tin Pan Alley, and Barbara Cook: Bell Telephone Hour 1960-1965, and The Umbrellas of Cherbourg which I've been dying to see. After all the business was taken care of, I took in the new photo exhibit there at the Performing Arts Library. It's Focus on the 70s: The Fabulous Photography of Kenn Duncan. A new book of pictures of the women he photographed - Divas! 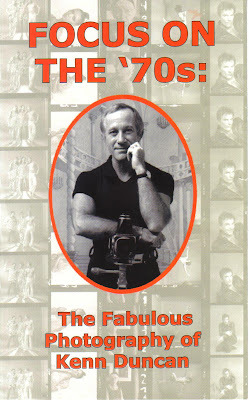 : The Fabulous Photography of Kenn Duncan - has been published and is available for pre-order now on Amazon. You know this one is already in my shopping cart! Kenn, a former professional dancer, took up professional photography in the late 1960s and extended into the early 1980s. Many of his photographs were published in the magazines Dance Magazine and After Dark. The photos he took of dancers, both in action and in portrait, are stunning. He had an understanding of their bodies and managed to capture both the grace and delicacy of their bodies, but also the unbelievable athleticism. Many of these photos are of nudes, but there is nothing dirty about them. They are simply breathtaking. There are also photos of many handsome male actors and models but my favorite were of the Divas - many of Angela Lansbury and Bette Midler, but also portraits of Bernadette Peters, Gwen Verndon, Dorothy Loudon, Alice Playten, Lillian Montivecci, and so many more. 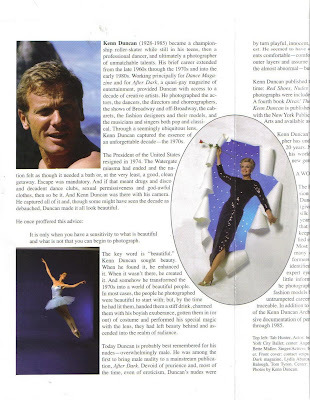 Kenn Duncan's photos were acquired from Duncan's family in 2003 by the Billy Rose Theatare Division and hte Jerome Robbins Dance Division. There are over 500,000 images in various formats in the archive. The walls of the gallery are covered with gorgeous shots of all sizes, but is probably only the tip of the iceberg of what is available in the archive. The exhibit runs through October 25th in the main gallery at the Performing Arts Library in Lincoln Center. That is the most fabulous errand list I have ever seen!